Canadian folk metallers Mongol from Devon, Alberta are back with their second full-length album “Chosen by Tengri“. The band was formed in 2009 and despite their irrelevant origin, their music and concept is dedicated to the ancient nomadic empire of Mongolia! In 2012 they self-released their debut full-length album “The Altan Urug” leaving many promises for the future. Now, 2 years later, in July 2014, they return with a much more professional and multidimensional album! There are many differences between the 2 works and compared to the debut album I see a huge improvement; actually I think there is a complete music redirection in ”Chosen by Tengri“. In the first album the band played technical and at times brutal death metal, adding various Mongolian folk tunes and instruments in the mix. This time though, not only they experiment with more styles, but the result is much more solid. They borrow elements from melodic death metal, epic black metal, folk metal, epic metal and Mongolian folk music, trying to create something new, instead of just combining these genres. The folk tunes and traditional acoustic instruments are less dominant now, while the overall atmosphere has a more epic Molgolian aura. The production is much better and everything sounds more natural and less distorted. Epic rhythmic guitars, melodic leads, technical riffs and solos, cooperate perfectly with epic, yet discreet synths and Mongolian traditional instruments. They add more depth and complexity in their orchestrations and at the same time everything sounds clearer and more balanced. The same goes for the vocals, where the brutal death metal growls of the past have been enriched with epic black metal screams, clean male vocals, traditional folk singing, epic choirs and few guest female vocals. “Chosen by Tengri” consists of 8 nice and diverse compositions and its total duration is over 43 minutes. All of their lyrics are in English, speaking about epic tales, myths and legends of ancient Mongolia. 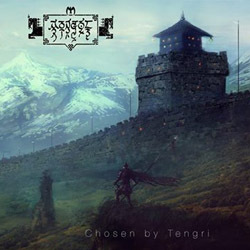 “Chosen by Tengri” is a great epic folk blackened metal album with a traditional Mongolian touch, totally recommended to fans of the genre. Mongol don’t focus only on this different “folk concept” though, but they try to compose good epic black death metal songs too. Everything seems more serious and professional compared to the debut, and if the band continues to improve this way, future can be bright for them! “Chosen by Tengri” is self-released by the band in a standard jewel-case edition with a 12-page booklet, illustrated by Jose Arias, including all the lyrics this time. In their official pages below, you can learn more about the band and listen to both of their albums.